May is National Physical Fitness and Sports Month. Despite May being the Physical Fitness and Sports Month, we should really celebrate this particular health awareness throughout all the months of the year. Physical Fitness is something that needs to be consistently worked on. Spurts of physical activity are more the norm than sticking to it, but something that is vital for everyone to know is that physical activity needs to be consistently done in order to benefit from all of the compounding benefits it has on the body. The consistency of exercising leads to the notion of being physically fit. It changes the body in ways that allow one to build upon a strength. As the miscibility of chemical compounds, where like dissolves/mixes with like, fitness leads to fitness, as laziness leads to laziness. Water and oil do not mix; their chemical components repel each other. As is so with human nature and the body. Laziness does not mix with fitness, their characteristic components repel each other. Everyone starts somewhere. Whether you park your car further down in the parking lot from the store entrance, you take the stairs to your office, you go for a quick bike ride or stroll around the neighborhood, start small. These small differences in your life will eventually lead to large differences if you stick to it. Consistency. In a few weeks maybe you will go for a longer bike ride or stroll. As you continue exercising, even in the smallest ways, your stamina for exercise increases. Your body’s fitness will increase as you increase your activities. From youths to the elderly, Physical Fitness is key to a healthy life. Celebrate National Physical Fitness and Sports Month by enrolling yourself or your child in a sports league. Organized sports has not only physical benefits, but significant mental health benefits as well. Go to the park with your dog. Keep moving. Eventually your heart rate will get accustomed to your routine and you will no longer be exerting yourself. At that point, an increase in activity is warranted to get your body to that next level of fitness. Every benefit of exercise applies across the board to all ages. If you start consistently exercising at a young age, its effects will be seen when you reach an elderly age. Physical activity leads to the improvement of: muscular strength, heart, bone, and mental health, a decreases risk for Type II Diabetes (we have started seeing Diabetes in children of young ages), as well as a decrease in your risk for heart disease. *Before significantly increasing your activity levels, consult with your doctor. 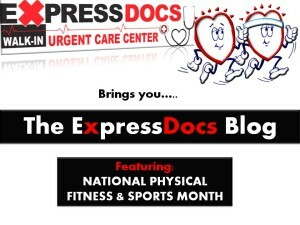 If you do not have a doctor or want health and exercise tips, walk in to ExpressDocs Urgent Care Center. The doctors on staff will be happy to talk with you about disease prevention and maintaining a healthy lifestyle. Of course we are here for the sick, but we would much rather help you stay healthy and fit than see you later on when dealing with complications from a multitude of chronic diseases. Come in now to start the preventative care of your long and healthy life! If you are suffering from any chronic diseases that may hinder your attempts at staying healthy, we will work with you to find a personal solution. There is not one method that works for everyone. One diet may help many people, but will fail others. The key is that everyone is an individual with individual needs, ExpressDocs will talk with you to find out what is best for you personally. Have any suggestions on staying Physically Fit and healthy? Leave a comment below, or submit your suggestions via our Contact Us link!